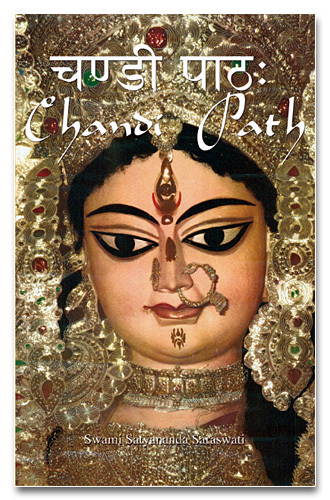 The Chandi Path is an ancient Sanskrit scripture originally found in the Markandeya Purana. It tells of the Glory of the Divine Mother Goddess and how She comes to existence to restore balance and harmony to Her creation. Shree Maa’s recitation of this powerful story comes to life with her unbound love and impeccable grace. Shree Maa has been devoted to God from her childhood. Leaving home at an early age, she performed sadhana in Kamakhya in the regions of the Northeastern State of Assam in India. She sat for most of this time in the silence of deep meditation, speaking very little and eating practically nothing. Her sustenance consisted of sandal paste mixed with water, a bit of turmeric root, holy basil leaves, and occasional juice fed to her by devotees. Her body weight reduced to little more than sixty pounds. People who saw her in deep communion with God for hours and days at a time called her the Goddess of the Mountain, the Goddess of the River, or simply Shree Maa, the Respected Holy Mother. After several years of deep meditation Shree Maa began to roam throughout India, worshiping in temples, forests, fields and homes. And she began to sing. Sometimes she would sing all night, and devotees would gather to be in the presence of this holy woman whose entire life is worship. In 1984 Shree Maa came to America, where she lives a simple life dedicated to daily worship. Fame and wealth could easily be hers, but she wants nothing to do with them, preferring to own very little and to offer all to God. Swamiji comes from the Dashnami lineage of Adi Shankaracharya and belongs to the Saraswati tribe of renunciates and scholars. Saraswati sadhus worship with both spiritual knowledge and devotion, and they live the lives of teachers and knowers of wisdom. Swamiji’s Guru, Swami Amritananda Saraswati, initiated him into Vedic Knowledge and Sanskrit and the Chandi Path and sacred fire ceremony as his primary system of spiritual discipline in 1971. For 15 years Swamiji walked the length and breadth of the Himalayas, during which time he fell in love with Sanskrit and became proficient in numerous languages including Hindi, Bengali, and Urdu. He practiced intense spiritual austerities, chanting the Chandi Path naked in the Himalayan snow and in the hot springs of Bakreswar. Wherever Swamiji went he would learn the local systems of worship and inspire those around him to join in the joy of selfless devotion. In 1979, Swamiji met Shree Maa when he was performing a vow of worship in a small temple in the interior of West Bengal. They subsequently toured India, sharing their divine love and inspiration by performing pujas and homas, and sharing their realization by openly teaching their methods of spiritual practice. In 1984 Shree Maa and Swamiji came to America and established the Devi Mandir, where they shine their beacon of light from Napa, California. Today, they work tirelessly to give every individual the opportunity to access these spiritual teachings. What a pleasure to listen to Shree Maa’s recitation of the Chandi Path! I am so inspired from hearing this CD, now I must get the book so I can read the translations praising the Divine Mother. Shree Maa, you chant with so much enthusiasm and energy… You are such an inspiration.